Over the past year, the Midwest has exhibited a range of divergent unemployment rates, with many metropolitan areas experiencing unemployment far above or below the national average of 9.0 percent. The Bureau of Labor Statistics noted that the highest unemployment rates in the Midwest metropolitan areas (as of September 2011) were seen in Rockford, Illinois at 13.4 percent, Detroit-Warren-Livonia, Michigan with 11.7 percent, and Kankakee-Bradley, Illinois at 11.2 percent. The majority of Midwest metro areas have been increased employment over the year. “Among metropolitan areas in the Midwest, 28 reported over-the-year decreases in nonfarm payroll employment, 62 reported increases, and 3 had no change in September 2011,” the B.L.S. reported. 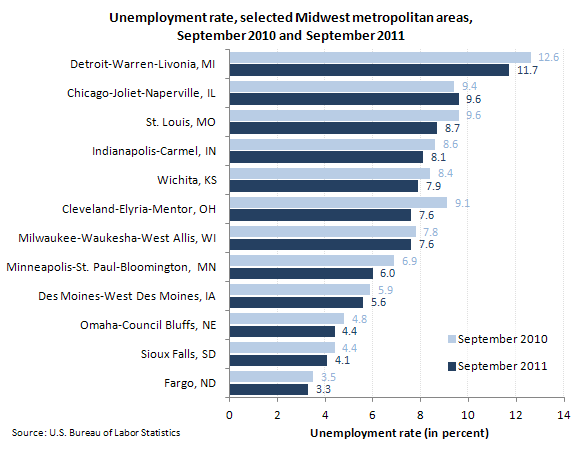 “Among metropolitan areas in the 12 states of the Midwest region, the largest over-the-year employment increases from September 2010 to September 2011 occurred in Chicago-Joliet-Naperville, Illinois (+21,100), followed by Minneapolis-St. Paul-Bloomington (+20,100), and Milwaukee-Waukesha-West Allis, Wisconsin, (+17,400),” the B.L.S. also noted.